The MGX-21 is the most unconventional, rich and technological of the 1400 cc grand cruisers built at Mandello del Lario. It is the latest distinguished representative of a line begun in 1921 when Moto Guzzi started to make unique hand built motorcycles as one-off collector’s items. Moto Guzzi is one of the greatest brands in the motorcycling world and in almost a century of history has produced bikes that are often ahead of their time, whose innovations are subsequently adopted by everyone. From the racing track to the streets of the world, the company has not compromised its Italian soul. Bolstered by universally recognised values, Moto Guzzi now expresses the influences and stimuli of motorcycle culture in an increasingly personal and unique style. The MGX-21 is the latest example of Moto Guzzi’s tradition of originality and courage. This model is dedicated to lovers of exclusive motorcycles, to people who like to feel excited even before they embark on a journey, simply by appreciating the majesty of this prestigious Italian bike resting on its side stand. The MGX-21 seems to invite you to fasten your helmet and set off, heading wherever the map takes you. The excitement felt even before you climb on board swells when the 90° V-twin engine roars into life. From the banks of the Lario to the corners of the world, your journey is marked by the rhythm of the strokes of the huge pistons of the Moto Guzzi big block. 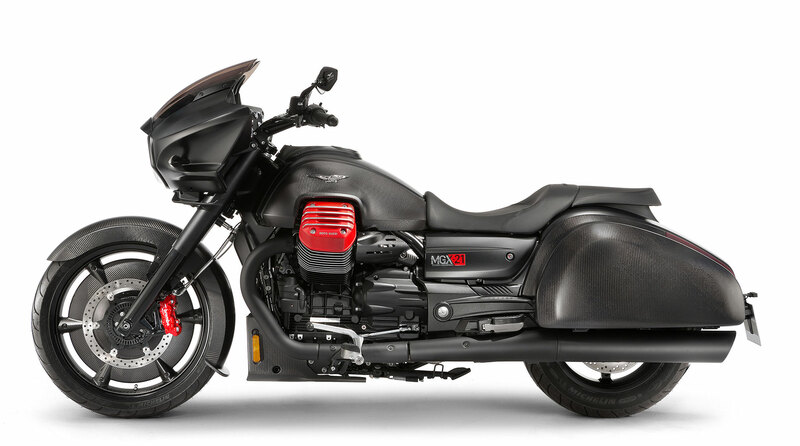 The design of the MGX-21 leaves little room for indifference and, like all Moto Guzzis, begins by showing off the engineering of the big 90° transverse V-twin engine. Its two large cylinders seem literally to explode out of the petrol tank, helping to significantly lower and streamline the side view. The red paint of the aluminium head covers emphasises the power this engine is capable of expressing, even in its aesthetics. 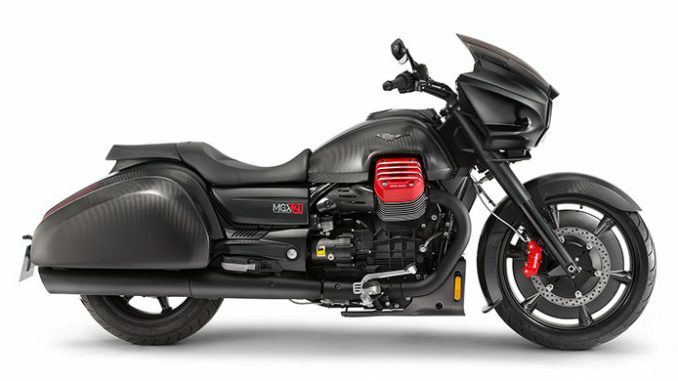 With a low tail and raised front, thanks to the striking and distinctive design of the big fairing, the MGX-21 takes on the appearance of a large, technological and luxurious motorcycle able to grind out the miles with a smooth ride. It’s certainly no wallflower, but rather seeks to attract people’s attention with its original shape and the mysterious nocturnal appearance created by the PADC (Piaggio Advanced Design Center) designers in California. 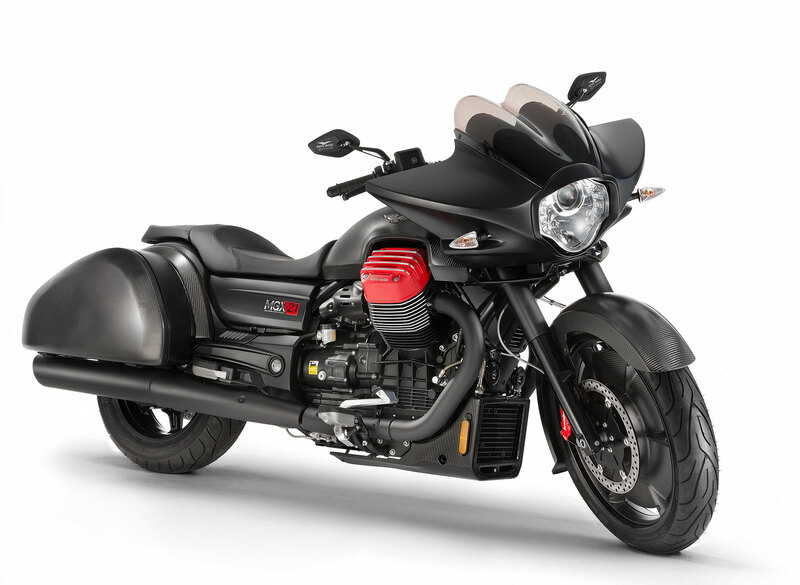 To celebrate such a personal, powerful and brave style, Moto Guzzi gave the new MGX-21 the evocative soubriquet of Flying Fortress. The Moto Guzzi bagger keeps the 21″ alloy front wheel, now protected by carbon covers with small openings where the spokes intersect with the channel. This design choice also brings the technical advantage of increased stability and ease of handling due to the passage of air from one side of the hub to the other while the bike is in motion. 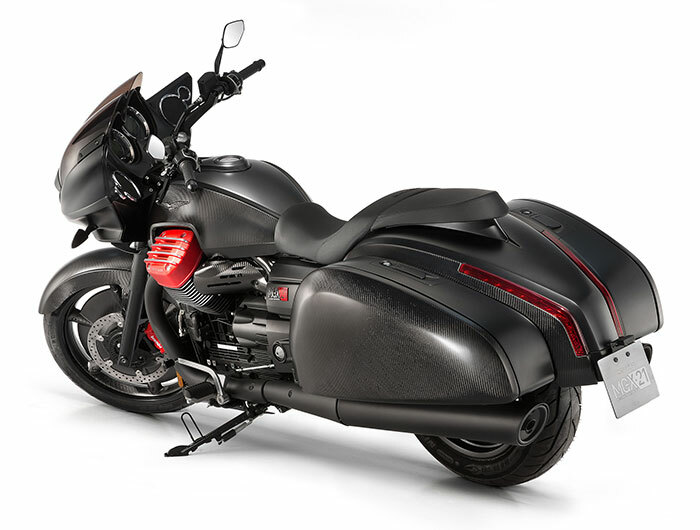 The Flying Fortress raises Moto Guzzi’s technological flag. 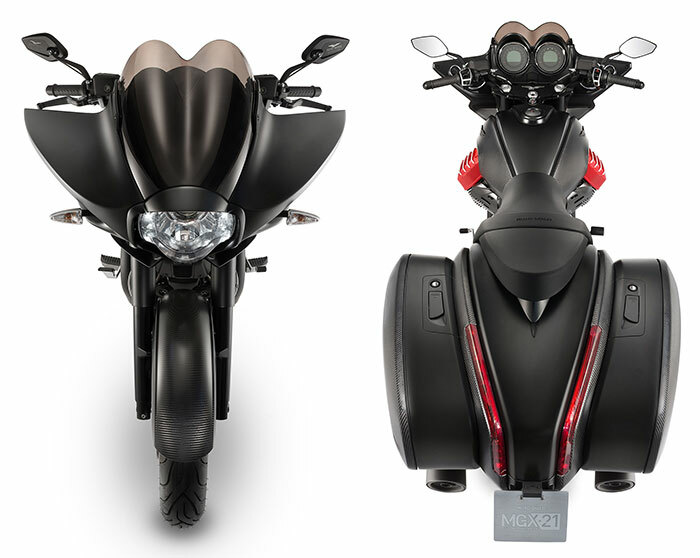 The new Italian bagger is distinguished by its high level contents some of which are unique and patented, helping to maximise riding pleasure and comfort, and of course safety. Behind the cowl a sophisticated instrument panel has a monochrome dot matrix display and real entertainment system. The latter includes a stereo and the intercom system. The Bluetooth module ensures full interaction with external devices such as a smartphone, which can be used as a music player or to manage the Moto Guzzi (MG-MP) multimedia platform, an exceptional source of information for the journey. The standard equipment is complemented by a sophisticated electronic engine management system, which includes the Ride-by-Wire multimap, in addition to two-channel ABS, traction control set to three different levels of operation (and excludable) and cruise control. The new Moto Guzzi also stands out for meticulous and obsessive attention to detail. The spectacular optical units use LED technology, while the electrical controls on the handlebars are made of metal. While respecting the solid century-old tradition, the MGX-21 reaches out to the future, employing materials typically used in the most advanced sports motorcycles. Indeed, many parts are made in high quality carbon, such as the front mudguard, the tank panels, the motorcycle case covers, the engine push rod and the front wheel covers. The adoption of the 21″ front wheel brought with it a major evolution of the frame to ensure high levels of comfort and riding pleasure. Moto Guzzi worked hard to define the new steering geometry and ensure balance and ease of riding. In so doing it thus combined the comfort and load capacity of a custom with the dynamism and performance of a cruiser, two qualities that are difficult to reconcile. The new tubular structure of the closed double cradle frame adopts the ingenious elastokinematic engine mounting system developed by Moto Guzzi to eliminate vibrations transmitted to the rider when moving. However, when stationary the bike still retains the throb of the Moto Guzzi big block’s two powerful 104 mm diameter pistons, which can excite even the most streetwise motorcyclist, intensifying the vibrancy of this model. The largest V-twin ever produced in Europe, which can deliver more than 120 Nm of torque with ease and precision from very low revs, has earned EU4 certification and a new exhaust unit with very long horizontal terminals. All this verve is controlled by a benchmark brake system for the category, worthy of a sports motorcycle, comprising a trio of large diameter discs and four-piston front callipers and radial connection.